His name was Brad, and he was really hot, a football player, and super popular at our high school. And he LOVED sugar cookies. It was only natural then, that my friends and I make some sugar cookies to entice him to come to one of our get-togethers. We slaved away in the kitchen, making what we hoped would be the best sugar cookies Brad had ever tasted. When they were finished, we didn’t even taste them. We wanted there to be plenty for Brad. They weren’t iced, as Brad liked them plain, but we did use cookie cutters to make fun shapes. Brad and his friend arrived, excited at the idea of hanging out with a bunch of girls and eating sugar cookies. Brad grabbed one off the plate, and we all leaned in for his reaction to eating one of our delicious, homemade sugar cookies. He took a bite… or maybe I should say he tried to take a bite. Our marvelous sugar cookies that would make Brad fall in love with us were rock hard. Brad’s friend grabbed a cookie, laughed, and threw it at the wall. I don’t know if it was the force at which the baseball team’s star pitcher threw the cookie, or the fact that they were so hard, but it definitely left a small dent in the wall. Upon further inspection, it was discovered that we left out one key ingredient: sugar. While we were mortified at the time, it eventually became a story we would talk about for years to come. Most of us have some sort of memory tied to the taste of sugar cookies. Maybe grandma made them every Christmas. Maybe you ate them at family cookouts every summer. Maybe you remember the sugar cookies from elementary school that “room mothers” brought in for every holiday. Buttercream Icing – I used to be all about homemade royal icing on sugar cookies, but once I had them with buttercream, I can’t imagine anything else! Edible Confetti – Cute little candy shapes on your cookies?! Why not?! They stick to buttercream and are a great addition to any cookie. Some of my favorites are the cows, autumn leaves, and moons & stars. Pictured at left are the pink pigs! 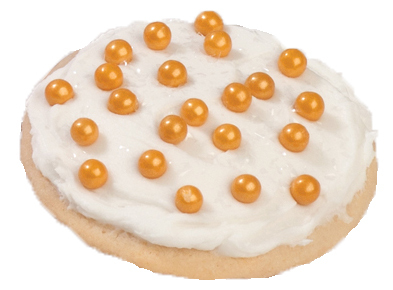 Edible Glitter – Baked goods always look better when they sparkle. 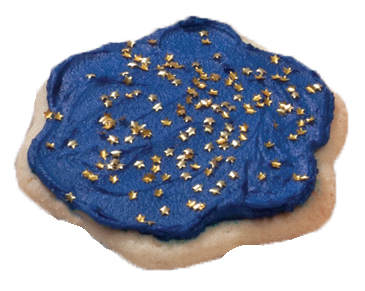 Edible glitter is the perfect way to add sparkle to your sugar cookies. Candy Beads – These are really fun, especially when you mix colors. You can also use white on colored buttercream for a neat look. Colored Sugar – No need to use plain white sugar when there are so many pretty colors of sugar you can use instead! Choose from sanding sugar or crystal sugar. Sanding sugar is a finer grain, while the crystal sugar is a little larger. Rainbow Candy Coated Chips – I love sugar cookies. I love chocolate. I love them put together! The combination of sugar cookie, buttercream icing and these candy-coated chocolate chips is a sweet explosion of flavor! 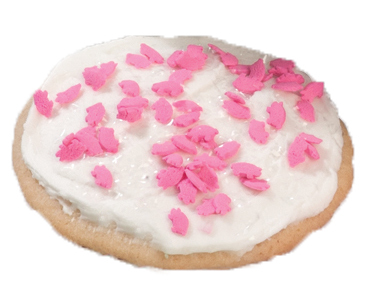 The possibilities are really endless when it comes to what you put on your sugar cookies. 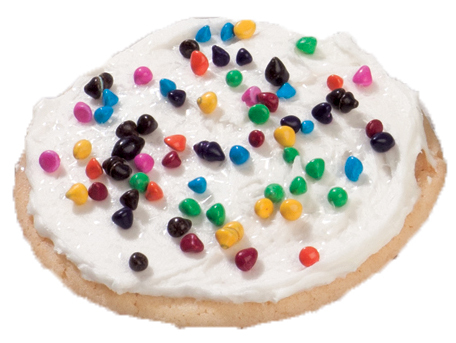 What’s your favorite sugar cookie topping?